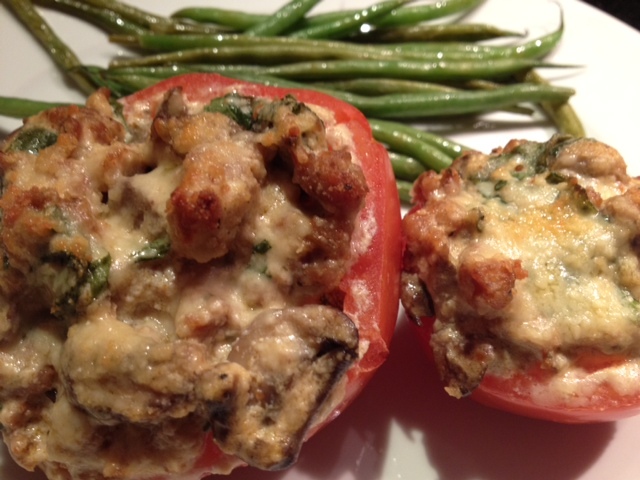 Chicken Sausage, Portobello & Ricotta Stuffed Tomatoes. 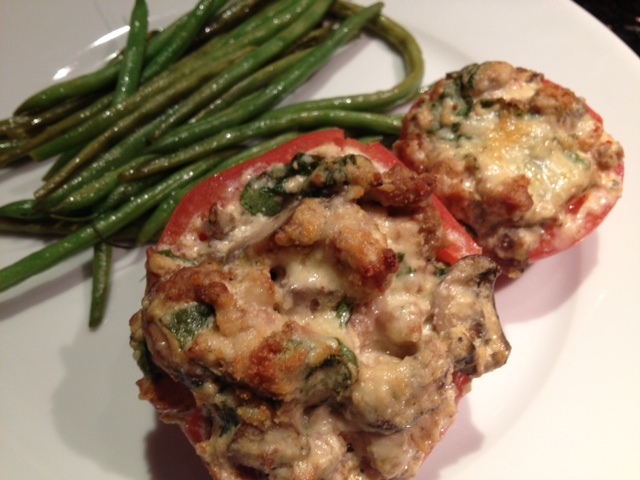 This is a great low-fat, low-carb recipe that will satisfy you and fill you up! It’s also a perfect wintertime meal because it’s warm and hearty. 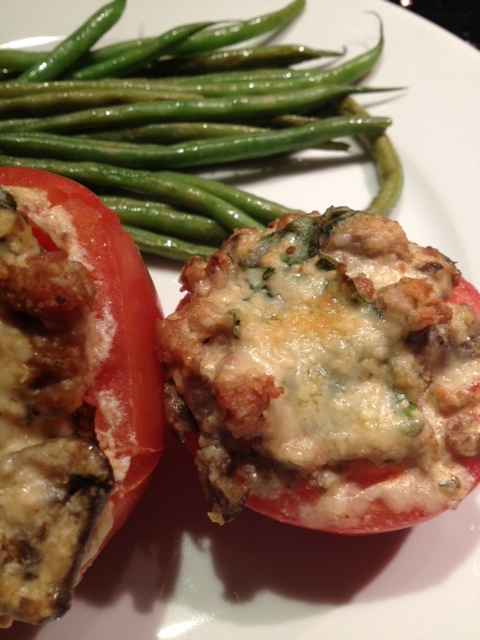 Any extra sausage/ricotta filling that you leftover can be put on pasta, rice or veggies. Begin by preparing the tomatoes. 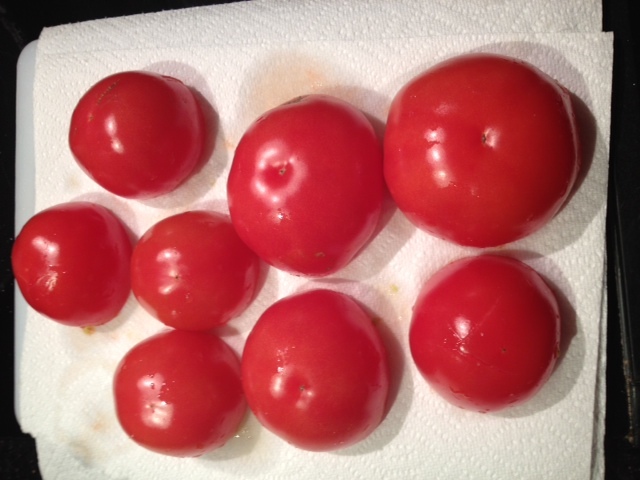 Slice the tomatoes in half and then use a small knife to cut around the center. Use a spoon to scoop out the center of tomato. 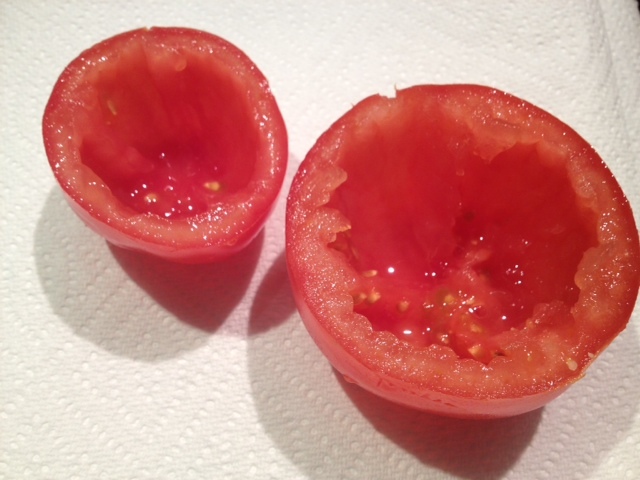 Generously salt the inside of the tomatoes and then place them open side down on a paper towel. This helps to drain any excess liquid from the tomatoes and the salt draws out the moisture. In a large pan on the stove, heat 2 tbsp of olive oil on medium heat. Add in the sausage and cook for about ten minutes until browned. Add in the portobello mushrooms and continue to cook for about 5-7 minutes until the mushrooms have lightly browned as well. 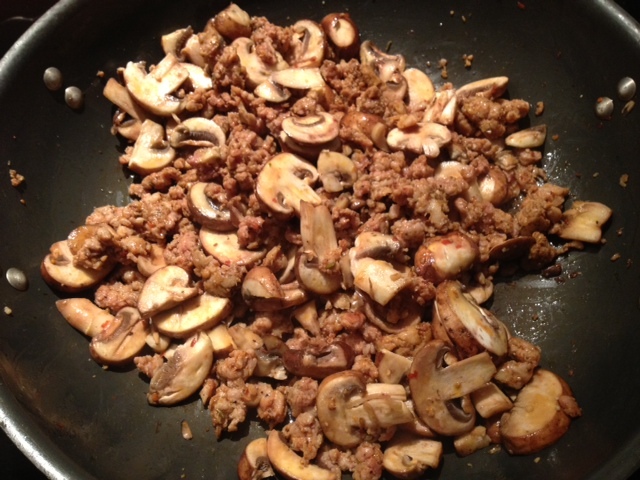 Remove the sausage and mushroom mixture from the heat and put it in a large mixing bowl. 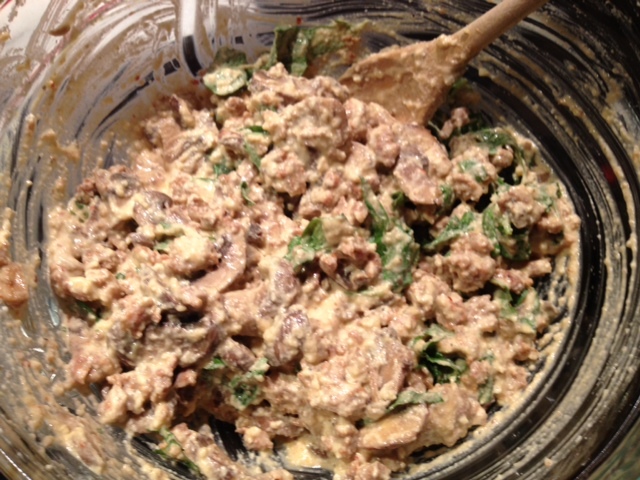 Add in the cream cheese, ricotta, Parmesan, basil and a small dash of garlic salt/black pepper and stir well to combine. 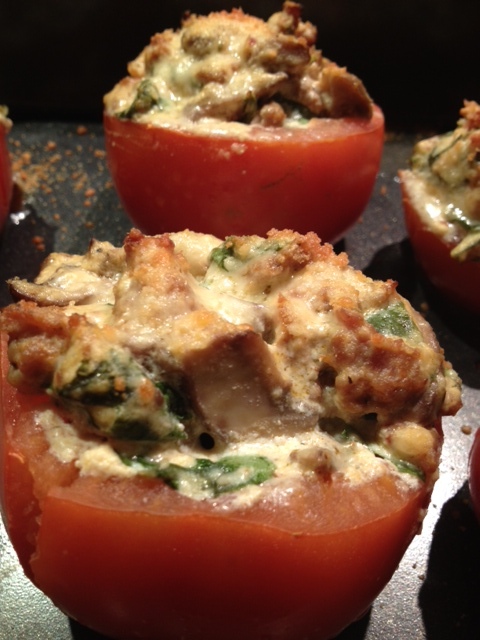 Use a spoon to place the stuffing inside each tomato. 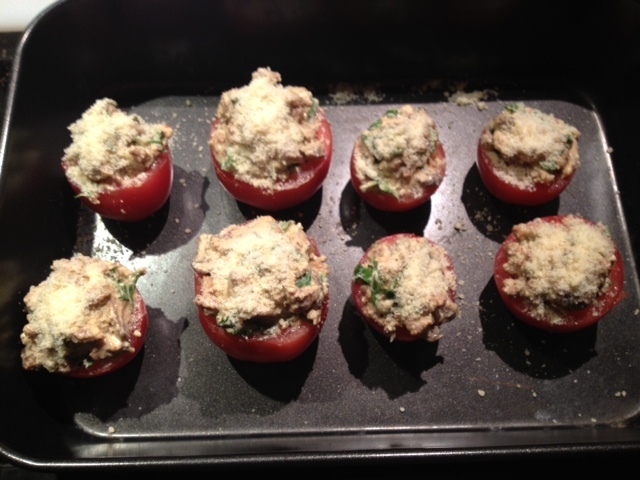 Place the tomatoes on a baking sheet and top each one with a small spoonful of Parmesan cheese. 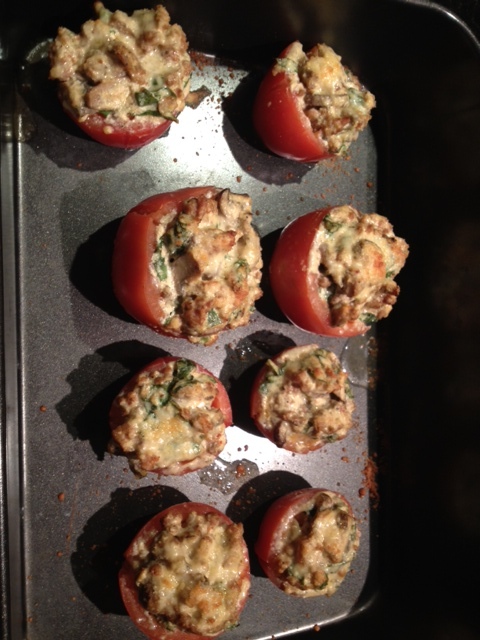 Bake in the oven on 375 degrees for about 25 minutes or until the tops of the tomatoes are lightly browned and bubbly. ← Crispy Prosciutto Caprese Salad.